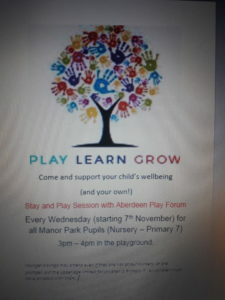 Our Play Ranger is starting the Stay and Play sessions for pupils and parents after school this week. Come and join your child playing from 3pm to 4pm every Wednesday in the playground. All pupils from Nursery to P7 welcome. Younger siblings may attend even if they don’t attend our school. Only children up to P7.